The first step is to write the name of the ink and the name of the pen (see above). I just noticed that each ink is from a different manufacturer – nice. It was actually quite a bit of fun – watching and scribbling, changing pens and writing a bit more. 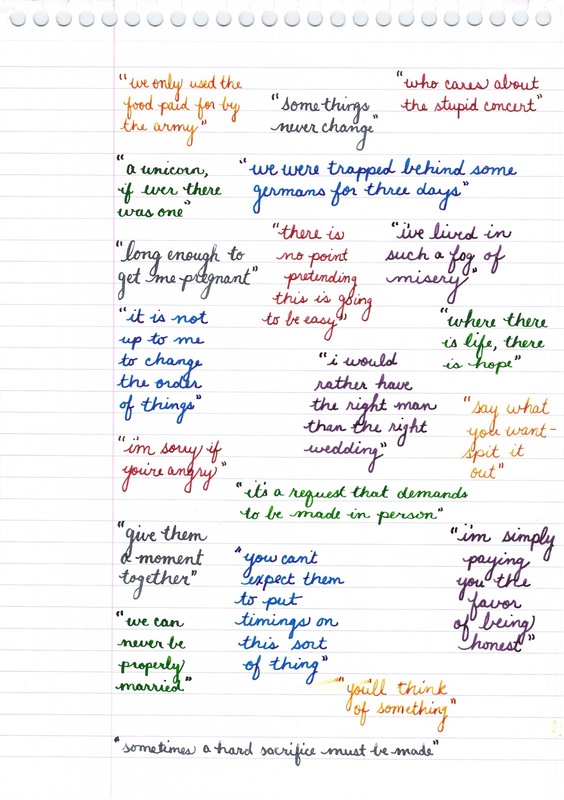 I love the way the entire sheet of paper looks – each color is pretty amazing on its own, yes? Let’s take a closer look . . .
Below – Private Reserve Spearmint. One of my favorite green inks. It looks a bit dark here to my eye, but it is usually quite cheery. Below – Montblanc Hitchcock. A gorgeous blood red ink if I ever did see one. Some really pretty shading in there, too. I have to confess, I have a quite a lot of this in my cabinet. Shall I keep it forever? Use it as if I’ll never run out? Or maybe even sell some? 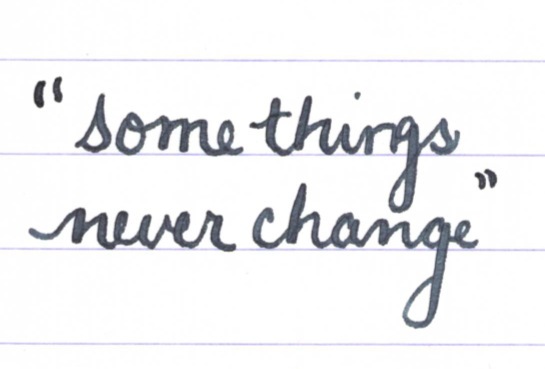 Below – Noodler’s Habanero. A favorite. That shading. The brightness of the color. Need I say more? Mm..wait, I already did right here. 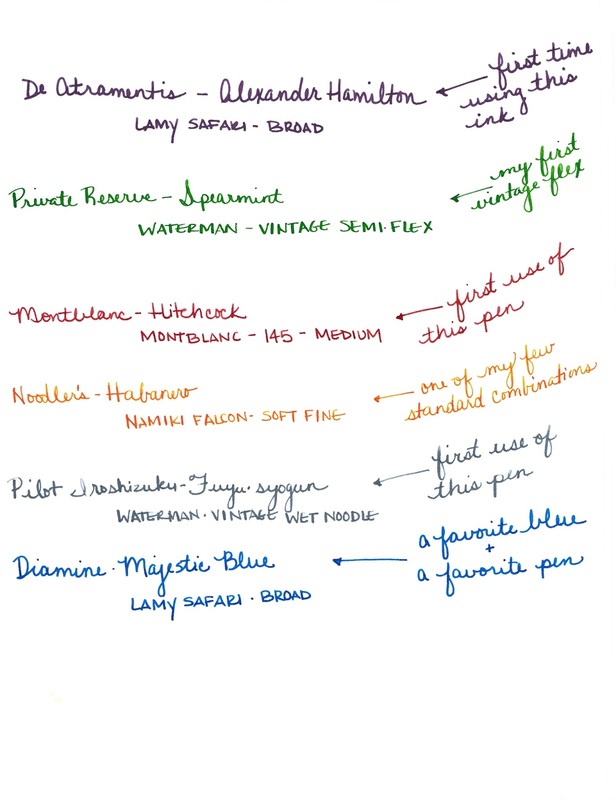 Above – Pilot Iroshizuku Fuyu-syogun. 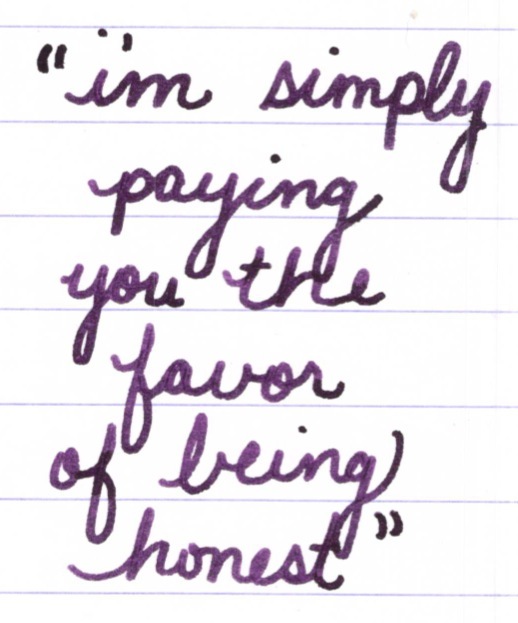 I wonder if I only could have one ink, if this would be it. Check out my big review here. It is crazy CrAzY to think that I, lover of bright and beautiful colors, would be so taken with a gray ink, but there you go. 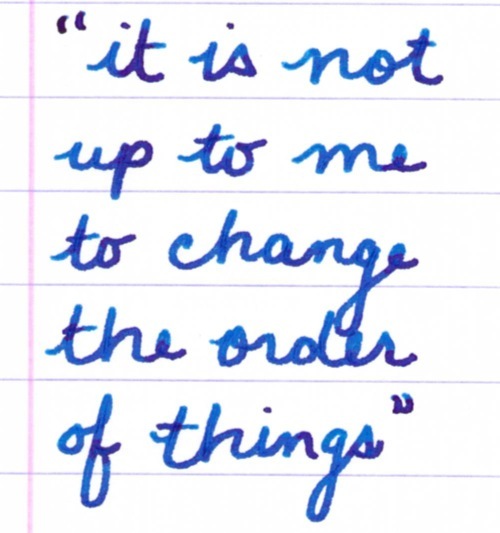 Above – Diamine Majestic Blue. Easy to see why it’s one of my favorites, yes? So pretty. And, so, there we have it – six pretty colors. All so different from one another and yet all so wonderful. 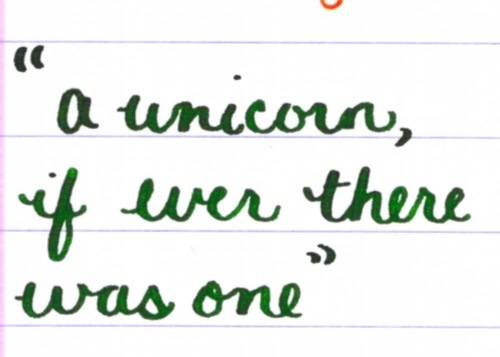 This entry was posted in INKS and tagged blue, de atramentis, diamine, flex nib, gray, green, grey, lamy, montblanc, namiki, noodler's, orange, pilot iroshizuku, private reserve, purple, red, waterman by Christine (Pentulant). Bookmark the permalink. I was sitting right next to you as you wrote, and I couldn't remember what show it was! I might have to try that Majestic Blue next… wow. 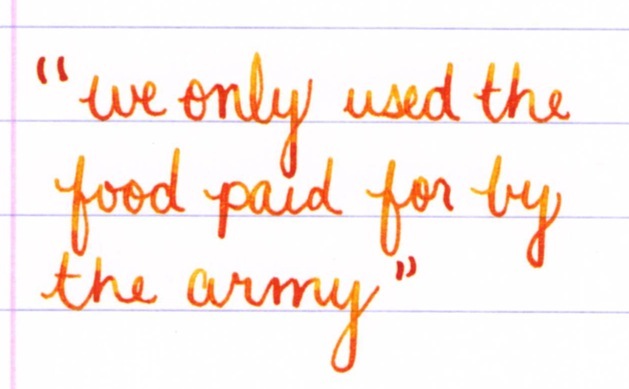 I'm so glad you named the show – a couple of quotes sounded familiar, especially the one about using the food paid for by the army, but I didn't recognize it right away. Downton Abbey is the best – I love it! Thanks for the ink review, too. I like the Habanero, nice shading and not too bright.